It can only be a sampling of the vandalism during the French Red Revolution. Quite apart from the widespread damage done by Hitler’s National Socialists and the Kaiser, every so often, the lunatics take over the asylum and start smashing up anything associated with the Ancien Régime, smashing up and stealing anything on which they can lay their hands. For example, Cluniac headquarters had the biggest gothic cathedral in Europe, as well as one of the most important, ancient libraries. Cluny is sometimes known as Cluny 3, the third church on the site. Less than twenty years after Henry VIII started smashing, vandalising and pillaging church property in England, France suffered the same delights with the failed Huguenot revolution. During the Wars of Religion [1562–1598], the Huguenots burnt a good part of the library at Cluny, while the Vandals of the French Revolution [from 1789] burnt most of what was left. The revolutionary vandals also demolished the church, turning it into a stone quarry and carting the church away piece by piece. The futile attempt by French revolutionaries  led to the widespread destruction of cathedral art. Beheading of statuary seemed to be very popular, as was the conversion of cathedrals and basilica into granaries, and carting off and selling anything moveable or attractive. This was quite apart from the damages of fire, storm and age, as well as various construction collapses. Ganagobie priory church: Home to splendid 12th-century mosaics. The monastery buildings and church were sold off by the French Revolutionaries. Then, the eastern end was deliberately destroyed in 1794, which resulted in the mosaics being covered by rubble and forgotten. Only in the 1890s were they rediscovered and were photographed. The mosaics were then recovered by earth to protect them.In 1975, monks moved back and started restoring the church. Whitewashing walls to satisfy the latest outbreak of Puritanism, carting off anything movable by the opportunitists and camp followers, smashing up stained glass as high as pikes could reach, are all behaviours common to the vandals in this anarchy and chaos. The labyrinth at Sens cathedral, formed of incised lines filled in with lead, was destroyed in 1769 during "The Enlightenment". Such behaviour has been recently reflected in the Taliban assault on the 2000 year-old Buddha statues in the Bamiyan Valley, you might say that the French revolutionaries imitated Cromwell’s iconoclasts in England. There, Cromwell initiated such destruction of stained glass that very little was left intact for modern view. During the French Revolution that started in 1789, the Revolutionaries nationalised the Catholic Church in France. That is, they stole its property and lands, as Henry VIII had done in Britain over two hundred years previously. What is amazing is that, for a thousand years, the gothic cathedrals of France have suffered from fire and storm, builders' miscalculations, incompetant 'restorations', and far more from local invasion and the repeated vandalism described on this page. Yet every time, with persistence and the support of local communities, so much has been saved, restored, repaired and rebuilt. The resilience of human nature is a most wonderful lesson of human optimism and endurance. The Revolution saw upheavals of worship: in October 1790, the Chapter [the assembly rooms for the clergy] was removed, while the decree of 2nd November 1790 deprived them of their assets and income. This behaviour was common throughout the Revolution and under Napoleon, as well as across much of Europe as states confiscated the wealth of the Church, seeking to suppress religion in a manner similar to that of Henry VIII. The Church had provided education, hospitals, and help to the poor. Monks, and even bishops, had their own prisons, all services increasingly taken over by the State. The clergy were thrown out on their ear, their homes ransacked, and the clergy were often reduced to poverty (see just below). Some even became brigands or rebel leaders. For a further 600 pages, try The Popes and European revolution . Chartres was place of pilgrimage and church for the canons and the bishop, where before the Revolution the cathedral was not a true parish. However, in 1791 it was made the only parish in the city. On 17 Nivose Year II (8 January 1793), the municipality compared the expenditures and revenues of the Masters of the cathedral schools, and seeing the declared deficit, ordered the removal of the previous management. The housing of the music school was sold, and so was the linen and property of its Master. On 9 Frimiare of Year II (15 November 1793) the cathedral was closed and worship forbidden, and the cathedral became the Temple of Reason as was common with the revolutionaries. In 1794, the Temple of Reason became the Temple of the Supreme Being. The statue of the Assumption of the Virgin, sculpted by Bridan, now symbolised the homeland. Under the Terror (5 September 1793 – 28 July 1794), the Cathedral suffered damage, but the building as a whole was preserved. Statues on the south portal were broken, the lead from the roof was snatched in order to make musket balls, while the central bronze plaque of the labyrinth was taken to make guns. The cathedral's treasure was looted, and the statue of Notre-Dame-Sous-Terre, an object of general devotion, was burnt. The revolutionaries decided to destroy all the sculptures and even the whole building, but this last was apparently prevented by suggesting that pulling down the building would create too much rubble in the town's streets. Angers is home to one of the most beautiful tapestries ever produced. It lived under the protection of the great cathedral of Angers, being brought out for major festivals when it was hung around the cathedral. It appears to have been chucked out. It came to the attention of Canon Joubert, some was found being used as horse rugs and other utilitarian purposes. I am almost certain that this desecration was another victory of the Revolution, but I have not yet managed to check this. You see, the French Revolution is generally elided as a great victory for modern democracy and the advancement of man. Therefore, the beastliness is often skipped over in the guide books and in literature for the promotion of tourism in France. In these more civilised times, the great tapestry has now been provided with its own environmentally controlled home in the chateau at Angers. During the French Revolution, the heads were knocked off the small statues lining the doorways of the West facade [illustrated just to the left]. However, the Revolutionaries couldn’t bring themselves to smash the renowned Smile of Reims. During the French Revolution, Soissons cathedral was used as a warehouse, suffering heavy damage. 1798: the remaining parts of the portal statuary were destroyed. 1799: restoration was started, but in 1815 two nearby powder factories exploded destroying much glass except that in the chancel. Laon cathedral, when compared to other Picardy churches, lost most of its decor and furniture in 1793. The heavier furniture was supposed to have been transferred to the country town, but the regional government decided that it would be too expensive and had a detailed inventory drawn up, so that everything could be sold to the highest bidder on the site. Railings and woodwork were dismantled. Paintings an statues were removed. The altars were burnt or covered in whitewash. A hundred or so paintings perished in the flames. In the canonical area, the library was destroyed. The cathedral was the target of much revolutionary zeal and bile, as Noyon was so closely associated with the French monarchy. In 1793, the statuary of the west and transept portals were ordered destroyed, an order that was carried out with great efficiency. Only four small corbel figures survived, which had been covered up. So the marvels of the statuary carving has been lost. The revolutionary government ordered the cathedral be sold, but the price put on it was so high that this did not happen, and eventually the horrors of the revolution receded. It was used as a hay barn, granary, stable and dance hall, again the usual combination of dedicated revolutionary desecration, tempered by utility. But all this was as nothing compared to the devastation caused by the Germans a few years after the above was written. For that vandalism, see the page about Noyon cathedral. On the 20th of Brumaire, year 11, it was announced by the mayor that this “ancient house of error” was to be demolished, while another entrepreneur wanted to turn it into a handkerchief factory. 1798 ... pulling down the cathedral and replacing it by jails and law-courts was considered. Fortunately, the influential Société des Arts stepped in and saved the cathedral. Le Mans cathedral is one of the very greatest gothic structures in France, second only to Chartres. Saint Denis, the French royal church, was heavily compromised by the Revolution when it was used as a hay barn. Stained glass windows were stolen, some going into a museum collection, while others were sold into the general art market to end up in private collections as far away as Britain of the USA. Some windows were dismantled in order to use the lead for making bullets. Relics are said to have been thrown on the local rubbish dump - a common behaviour for many churches. The eagerness was enhanced by the fact that this was a site of royal internment. So the revolutionaries were smashing up the tombs and remains. This was part of the enthusiasm for desecrating bodies and religion that the new rationalist and atheist order that the Revolution was welcoming in. As was traditional with such regimes, the French Revolution is estimated to have left in its wake at least fifty thousand bodies. These victims were very often selected with no rhyme or reason. The revolutionaries’ enthusiasm included drinking blood, using heads for footballs and carving up naughty bits. For more on Abbé Suger and Saint Denis, see Cathedral construction. Sainte-Chapelle suffered much during the centuries, from repeated fires [1630 and 1736] and even flooding of the Seine . And then, of course, came the French Revolution. Sainte Chapelle was used as a flour store, a club room and a judicial archive. Sainte Chapelle was not handed back to its intended use for about forty years. After the depredations of the Revolution, excellent restoration and refurbishment was supervised by Jean-Baptiste-Antoine Lassus [1807-1857], and continued by Eugène Emmanuel Viollet Le-Duc [1814 – 1879]. At the time of the Revolution, Fontevraud Abbey was the richest and most powerful abbey in the kingdom. It was pillaged, ravaged, partially burned. The orders were to ‘delete’ it completely. The monks’ priory was destroyed in 1793, and the rest was meant to follow. Napoleon saved the remaining buildings from total destruction. In 1795, several proposals were made for other uses of the abbey, the three suggestions being: develop the former abbey hospice, turning it into a sailcloth factory, or a prison. 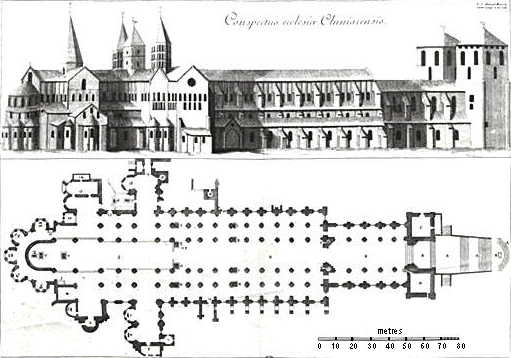 These three options were proposed for many abbeys, including Clairvaux and Mont-Saint-Michel. Fontevraud abbey was converted into a prison between 1804 and 1814. Fontevraud was a prison until 1963, considered to have one of the hardest regimes. However, some detainees remained until 1985 to help restore the abbey to become the historic monument that visitors see today. Fontevraud abbey is now one of the most complete monastic sites still surviving. Fontevraud is now a major tourist attraction, a UNESCO World Heritage site. You could spend a whole day, or more, exploring the complex. It includes the tombs of Henry II, Eleanor of Aquitaine, Richard I (the Lionheart) and Isabella of Angoulême, wife of his brother John Lackland. This library was formed in 1791 with works confiscated from the libraries of religious establishments in the Department,. The library completed in 1792 by books seized from well-off and bettereducaated emigrants. As then the municipal library, in 1940, the library occupied 945 m². The impact of the Second World War will be much more direct. For a few days, in June 1940, during the debacle, the government and the Assembly sit in the city. And a few days later (20-22 June), the German bombings cause fires causing the destruction of much of the local heritage (including the destruction of the library of which much of the treasures disappear forever ). In May 1944, it was the Allies who bombed Tours, this time mainly the railway installations. The city is liberated on September 1st of that year. Stored in cellars and saved: 816 manuscripts, 74 incunabula (unica) and books from the Tours region, 132 minute books (1408-1817) 163 account registers (1358-1671), 192 archive boxes (Xe -XVIIIe century) , plus about 1,000 books that were on loan at the time.The fire consumed 215,000 pieces - 1200 manuscripts, 400 incunabula, all the beautiful bindings and prints, 1,592 volumes from the Taschereau library, collections of seals and coins, 180,000 prints and 140 collections of periodicals belonging to the municipal library, as well as the "collections and stock" of six companies. Tours library was set on fire. The bombings of the Second World War (1940 and 1944) were devoted to a large part of downtown Tours. The destroyed abbey was replaced by square Prosper-Merimee. Part of the center of the city of Tours is totally destroyed during the gigantic fire of 20 to 22 June 1940, fire caused by German incendiary shells. The Wilson Bridge ("stone bridge"), which supplies the city with water, was dynamited to curb the advance of the Wehrmacht. Unable to extinguish the fire, the inhabitants could only flee. As blasting Wilson bridge on the night of 18 also destroyed the line supplying the city with water, and because of strafing and the German bombing, firefighters were powerless to fight the fire. In 1940, Tours served as an intermediate point of retreat for the French Government whose armies retreated before the advance of the Germans. The German bombings of June 1940 demolished part of the city center making disappear many old monuments. On the 15th of June, German planes bombed columns of refugees at Parcay-Meslay. On the morning of the 16th, the Prébendes district receives shells and at 1:30 pm the Italian air force fires on the stone bridge. On the 17th of June Marshal Petain asked the Armistice for the Germans. The French Army, having the desire to defend the city, blew up at 23h an arch of the Saint Symphorien side bridge. On the morning of 19 June the Germans are positioned at the entrance of Tours and fire shells on the city. The French artillery moved to Joué les Tours and fired on the German positions of Saint Symphorien. The bombing of the city continues all day and the next day 20 June. Nevertheless the 20, at 17h a truce is granted for the passage of the French delegation in charge of discussing the Armistice. The Mayor of Tours took the opportunity to discuss with the German leaders. Finally the bombing of the city will not resume but the damage is considerable, twelve hectares of buildings have been razed. Boulogne-sur-Mer cathedral: destroyed by the Revolution. Tulle cathedral was used as a factory for firearms! It also suffered other vicissitudes. The cathedral was still a mess until recently, the cloister surviving better than the rest of the cathedral. Restoration is now under way. Avranches: Saint-André cathedral destroyed during the French Revolution. Perigord cathedral served time as a shop. Mâcon cathedral appears to have been destroyed as a result of the Revolution. Mâcon cathedral in a decaying state during the latter half of the 19th century. ... and on and on it goes. Maillezais cathedral, Abbaye Saint Pierre, was destroyed by the Huguenots. 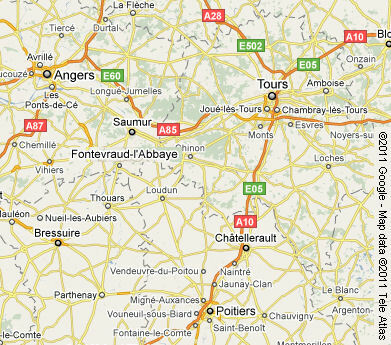 The ruins can still be seen, about twenty-five kilometres north-west of Niort. A projection jutting out to support a weight.